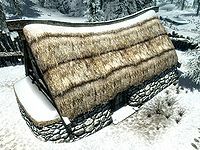 The Stumbling Sabrecat is a tavern located within Fort Dunstad in the southern part of the Pale. The building sits in the parade grounds of Fort Dunstad. The owner, Baral Sendu, was apparently killed by bandits occupying the fort. The counter immediately on your left upon entering holds an empty strongbox, a lockpick, bottle of alto wine, and four loose septims on top. Underneath the counter is five salt piles, eight potatoes, an iron war axe, a bunch of jazbay grapes, a medium coin purse, three loose septims, and a bottle of skooma. Against the west wall behind the counter is a set of shelves holding nine bottles of alto wine and six bottles of wine. There are a flight of stairs leading down to the cellar against the rear wall to the north. The main part of the first room is used as the sitting area for the tavern with a few tables and chairs with a bottle of Nord mead, a bottle of alto wine, and a bunch of jazbay grapes on one and two bottles of Nord mead on one of the tables. An unowned, single bed sits in the southwestern corner. A fireplace in the middle of the east wall has a cooking pot in front with three sets of imperial light boots, a pair of boots, and a bottle of wine sitting on the hearth. Above the fireplace is a weapon plaque holding a steel greatword and above that is the mounted head of a sabre cat with a bottle of alto wine in its mouth (see notes) and a copper and onyx circlet on its head. Downstairs are two bandits. There is a pile of firewood and a stack of barrels under the stairs. Further to the right are two sets of shelves. The first is full of small barrels of mead while the second holds a leather helmet, a set of hide armor, and a pair of leather boots. A double bed with the body of the former owner of the tavern, Baral Sendu (with an iron dagger still in his neck), is still usable. There is a dresser containing clothes at the foot of the bed and an apprentice locked chest to the right, against the south wall. Another food barrel is in the southwestern corner with a cupboard to the right of that holding more clothes. To the right of the cupboard is a long wooden table with a random stamina potion, an iron dagger and four more loose septims, with a large vat to the right of the table. There is a mounted sabre cat's head above the fireplace with a bottle of alto wine in its mouth, presumably a reference to the inn's name. After starting the Imperial questline, Sendu's body and the two bandits present in the basement are removed and the place is cleaned up. The same is true if the fort is cleared from bandits and occupied by Stormcloaks. Once this happens, the inn can be used as a convenient player house; it has beds, cooking, and the dresser and cupboard in the basement are safe containers. The steel greatsword above the fireplace cannot be removed.